The old bike that got stolen was a toy store mountain bike I bought a long time ago. The bike was starting to rust and the ride quality wasn't satisfying at all. Simply put, it's more like a toy than a dependable bike. 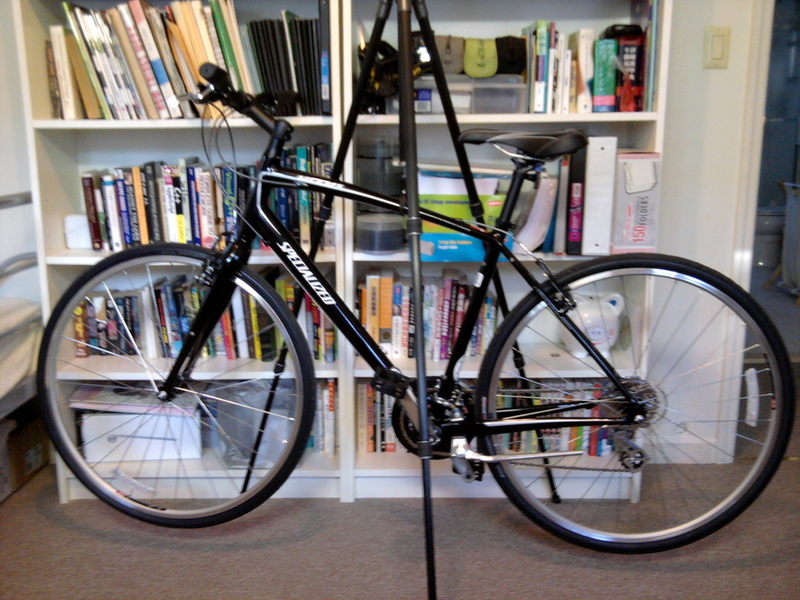 This time, I decided to purchase a "real" bike from a local bike shop, as I planned to do some serious commuting on it. After doing some research on the internet, I settled on the Specialized Sirrus. It was designed with commuters in mind with a lighter weight aluminum frame that has a more upright riding position, steel fork, bigger 700×32 tires, and 21-speed Shimano branded drivetrain. After riding it for a few days, I found it very different from the bike I used to ride. The lighter weight, of course, makes it easier to pedal but also makes the handling more sensitive and the bike has better weight distribution. The aluminum frame is stiffer than a full-suspension mountain bike, further improve handling. Together, they increase cornering speed and make the bike feels faster. One down side riding on a bike without suspension is that you will feel every road vibration. This is especially troubling when your local government doesn't do a good job at maintaining the roads. But I rather have speed instead of a more comfortable ride. The biggest compliant I have with the old bike is that my back always hurt when I ride with my backpack. The Sirrus has a more upright riding position. Backpacks are no longer a concern. Also not having to bend over, I can ride on the Sirrus a longer distance and still feel comfortable. The Sirrus is not without flaw. It uses "Body Geometry" grips that are supposed to fit the hands better. Trouble is, the grips assume you can always hold them at the optimized position but that is never possible. First the grips themselves don't want to stay in one fixed angle. They will rotate slightly forward or backward as you ride. Second, your body will move around as you are riding. It's hard to stay in one fixed location. When holding the grips not optimally, they will cause discomfort or even minor pain during long rides. The size of the grips are also smaller than I would like. This is a relatively easy one to fix. I just need to change the grips to a more traditional cylindrical one with a larger diameter.